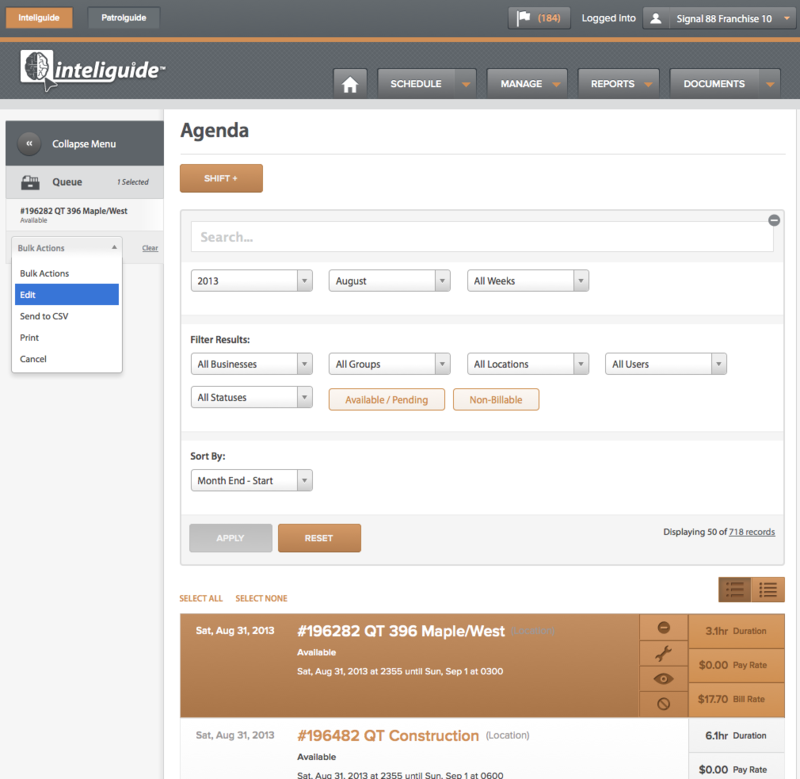 The Agenda is a List representation of the Inteliguide Schedule. It can be used to Bulk Edit Shifts, print your Schedule, generate a .csv version of your Schedule, and access Shift Details, Activity Reporting, and Time Punch Editing. Note: Users can access the Agenda by clicking on the Schedule menu drop down. 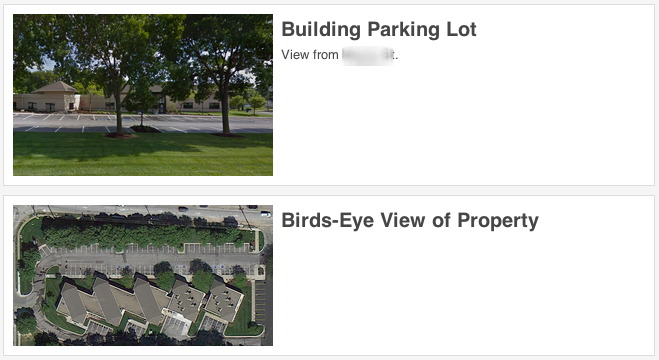 Note: Please see Groups vs Locations for a description of how the Groups vs Locations Filters work with Locales. Cancel - Simply cancels the selected Shifts if they're not already cancelled. Make one or many selections and select the Send to CSV Bulk Action. Your selections will be formatted into a comma separated value file format for easy import into programs like Microsoft Excel. The Bulk Action kicks off a background process that once successfully completed will send you a system message to your Inbox with the file attached. You can now additionally send up to 10,000 records (easily a whole month of Shits at a time in all markets so far) to CSV with a few clicks of a button. Simply click the total Shifts tally on the Filters Panel and click Send to CSV. Confirm and you will find the file delivered to your Inbox as a system message with a CSV file attachment. The contents of the attachment will reflect whatever filter settings you ran prior to exporting the results. Make your selections and click the Print Bulk Action. This will send all your selected rows to the printer output of your choice, formatted for print. Note: To select your whole month, scroll down until you can view all your Shifts, then scroll back up using the handy Scroll Up button and click the SELECT ALL link. This only works on Scheduled Shifts with End Dates/Times in the past that have NO associated partial or incomplete Time Punches. If the selected Shifts do not meet that criteria, they will not be processed. For all shifts that do, Time Punches will be created matching the Start/End Dates/Times. For those qualifying Shifts with Lunches, the Fill Punches Bulk Action will position the appropriate Lunch Duration between the Start and End Dates/Times. We've built this in as a tool for markets that don't rely upon Time Punches as much as others, either due to alternative Time & Attendance methods, or due to other circumstances. Since the Fill Punches makes MANY assumptions as to the actual Time & Attendance of associated Users, we implemented a strong confirmation and disclaimer prior to the Bulk Action processing any Shifts. Clicking on the List Item link will take you to the Shift Details. Here you will see all the information associated with a Shift. What status it's in, who's scheduled (if anyone), what it pays, bills, and all the other attributes that have already been discussed about Shifts. 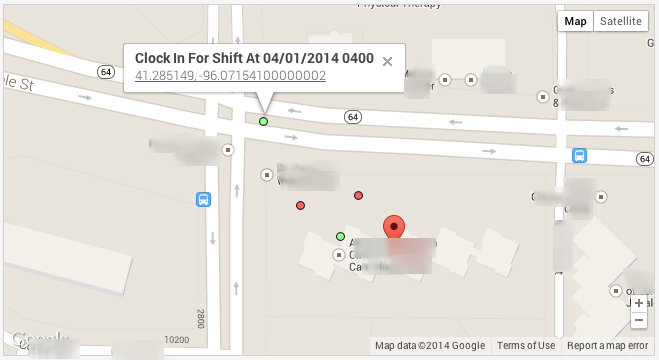 Clicking/tapping on the markers will give you detail for Time Punches or address information. The small circles represent Time Punches (green for clock/lunch in, and red for clock/lunch out), and the Location markers that we're all so familiar with on google maps represents the Location(s) covered by the Shift. 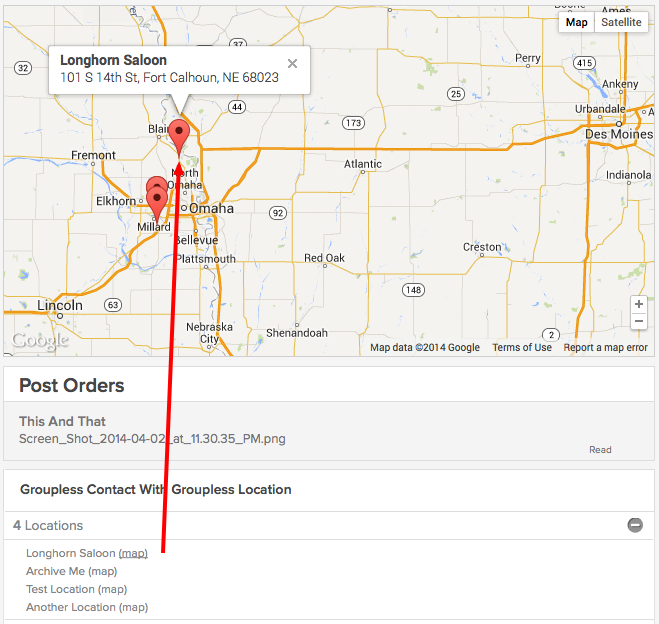 Clicking/tapping on the '(map)' link in the Locations Collections will find the relevant Location marker on the map and will open the information popup as though you had clicked/tapped on it directly. This is helpful for when separate location markers are very close to each other depending on your map zoom level. You can see in the example that a Clock In Time Punch was made from a car on approach to a Location. 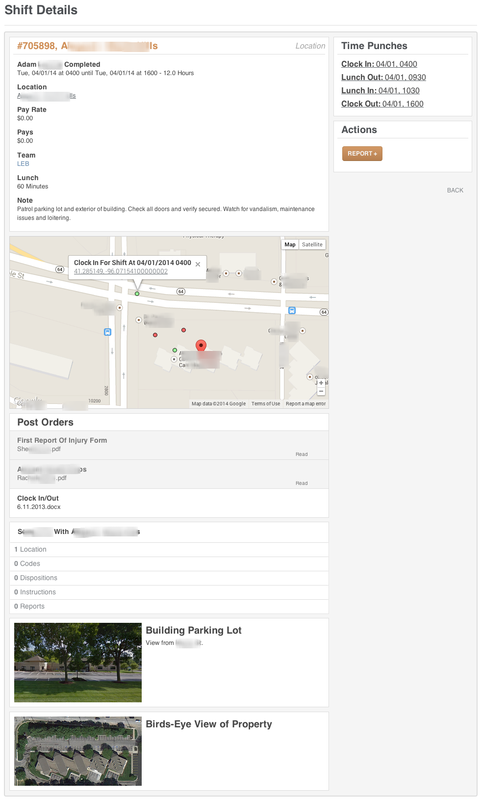 Shifts that are generated from Dedicated Work Orders can have post orders assigned to them. These are links to one or more existing documents in the system that bear some relevance to the shift in question. Downloading/viewing a document will be logged for accountability reasons. Here you'll see the relevant expandable/collapsible Contacts, Location, Code, Dispo, Instruction, and Report collections that belong to the Shift. These things can change throughout the life-cycle of a Shift, especially the Reports count as new ones are added. Contacts are assigned through Dedicated Work Orders, and will appear for any generated Shift. 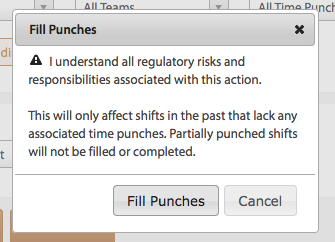 If Users were unable to create these punches while working a Shift or their Punches were found to be erroneous, for whatever reason, Admins can easily click 'EDIT PUNCHES' and modify the values. Note: Any of the shifts can be given any Date/Time range and we do not validate the entries for continuity. It's difficult to determine intent with complex date/time data, so in lieu of interpreting and modifying input, we simply validate that it's in an acceptable format for dates and times. 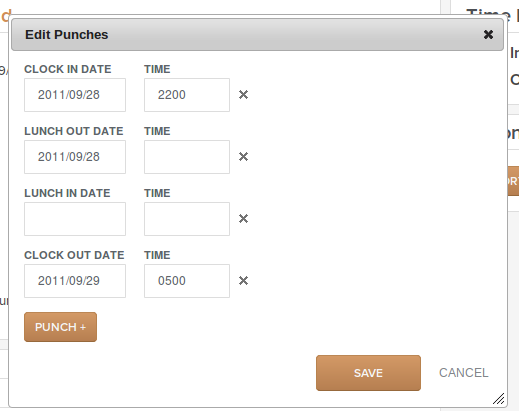 Ideally, we'd like to see Users making as many Time Punches as they can in real-time as that's less prone to error. Please reference Add Shifts Form info in Shifts.